Johnny, Edgar and Rick on Rockpalast! 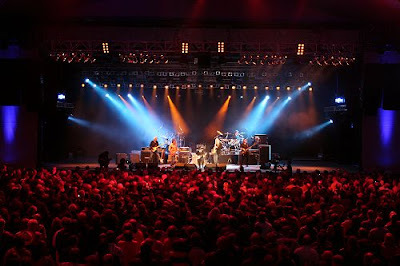 Johnny's May 12 reunion gig with Edgar Winter and Rick Derringer in Bonn, Germany, was recorded for Rockpalast, the enduring German rock-music television show that broadcasts to a viewing audience of millions across Europe. The three-hour performance, recorded by WDR, will be shown in its entirety June 2-3 before taking its rightful place in Rockpalast's historic archives. Need updates? Johnny and the band are getting ready to head west, and we've got details and more photos right here. Got photos? We'd love to see anything from Johnny's recent tour of Europe. Send 'em to info@bullseyemanagement.com. 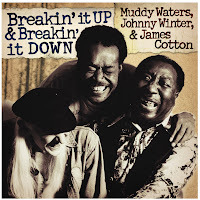 And remember: Breakin' It Up, Breakin' It Down featuring Muddy Waters, Johnny Winter and James Cotton hits stores June 5, 2007. You can find all the details here, including the complete track listing and Bob Margolin's liner notes. In 1977, Muddy Waters released his triumphant comeback album, Hard Again. The first collaboration between Muddy Waters and Johnny Winter, the album revitalized modern blues, introducing Muddy to a new generation and featuring a band of celebrated players that has yet to be duplicated. In support of this Grammy-winning album, a concert tour was launched in March of 1977 and featured the same illustrious line-up that recorded Hard Again: Muddy, Johnny, James Cotton, Pinetop Perkins, Bob Margolin, Willie “Big Eyes” Smith and Charles Calmese. The tour would become the stuff of legend. The never-before-heard Breakin’ It Up, Breakin’ It Down captures this historic tour at the height of its intensity and features some of the greatest live material ever recorded from Muddy Waters’ legendary career. Want more? We've also got the album's complete track listing, along with liner notes from Bob Margolin. Updates: In addition to the new release, click here for information on upcoming shows and tickets. Johnny just wrapped up a series of dates in Europe and is now gearing up for a run to North Carolina next weekend. Once that's done, Johnny will have three more shows left during the month of May: Asheville, North Carolina (May 25); Knoxville, Tennessee (May 26); and Cape Carteret, North Carolina (May 27). Hey Europe! Any photos or show reviews to share? Make a post at LiveBluesWorld.com or e-mail 'em to sean@livebluesworld.com. See you on the road!